Every human experiences an inner emptiness of the soul, that gnawing feeling and unquenchable longing that drives us to sacrifice everything we have and everything we are so we become more beautiful, more successful, and more powerful. We are by design a worshipping people, giving our lives and our devotion to something to pursue and adore, somebody to idolise. What drives this futile attempt for something more is the hearts true desire for significance, worth, and value - a desire that can be met only in the person and worship of Jesus Christ. Learn how to replace and not just relinquish these idols by turning your focus and worship towards God. He is the only one who can set us free from the endless pursuit of everything else. Empty Promises by Pete Wilson was published by Thomas Nelson in March 2012 and is our 17129th best seller. 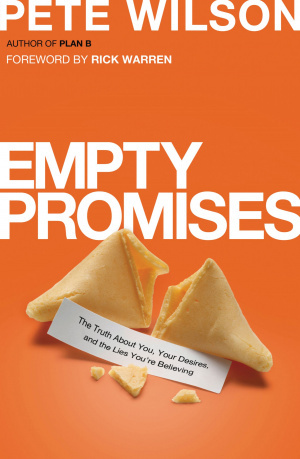 The ISBN for Empty Promises is 9780849946516. Be the first to review Empty Promises ! Got a question? No problem! Just click here to ask us about Empty Promises .